We served Roast Ducks for a dinner party last Sunday night, hosting our photography class teacher, our neighbor and her granddaughter. Preheat oven to 350 degrees-F. Remove neck and organs from inside duck cavities. If duck includes liver, set aside for another use. Place neck and remaining organs in the bottom of a large roasting pan. Prick duck skin with a pointed skewer, careful not to the prick through to the flesh, just the skin – this will allow the duck fat to be released through skin during roasting. Place the roasting rack from the pan over the organs, place the ducks breast-side up on the rack. Place roasting pan on a rack in the center of the oven. Roast for 1-1/2 hours or until skin is browned. Juice oranges while ducks are roasting, set juice aside. 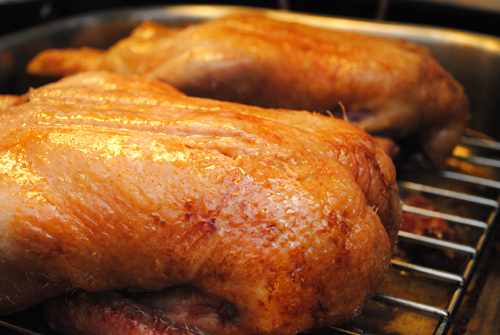 Flip ducks and roast for an additional hour or until ducks are done – the skin should be brown and crispy. Transfer ducks to large platters to rest. Reserve 2 to 3 Tbsp. duck fat and discard (or save for another use) remaining fat in the roasting pan. Place reserved fat in a small saute pan, add flour and stir with a whisk to make a roux. Cook over medium heat until golden brown. Place roasting pan across stove burners and heat over medium heat. Add orange juice to the pan and bring to a boil. Scrap organs and pan drippings off bottom of the pan while the juice boils. Strain contents of roasting pan into a clean sauce pan, discarding the strained solids and return sauce to the stove over medium heat and return to a boil. In small increments, add the roux to the orange sauce and whisk, allowing the sauce time to thicken. Continue to add the roux until the sauce thickens to a thin gravy consistency. Once again, strain the orange sauce into a gravy boat for serving. 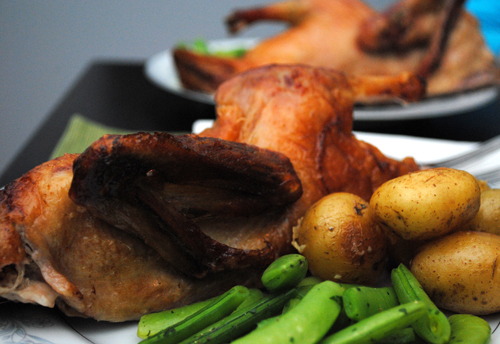 Cut ducks in half through the breast bone and serve one-half duck per person. Serve orange sauce in a gravy boat on the side, to be poured over duck meat.